City and county officials celebrated this week the cooperation they say led to the sale of a piece of port authority property to a city homeowner. From left, Scioto County Commissioner Bryan Davis, Portsmouth Mayor Kevin E. Johnson, county development director Robert Horton, homeowner Michael Keys, his fiancee Toshia Grizzell, and her son Jaxson. Portsmouth resident Michael Keys says the change will help revitalize his Boundary Street neighborhood, as well as give his children a larger place in which to play, as he and his fiancée plan on using recently aquired property as an addition to their backyard. Officials involved — from both Portsmouth and Scioto County — said they hope the transaction signals to the community that local governments are ready to cooperate with each other, and any perceived chaos at the municipal level has begun to fade. “It’s a nice step up for that area,” says Phil LaJoye, a member of the Southern Ohio Port Authority Board of Directors. During a meeting to announce the transfer, Keys took possession of a piece of property previously owned by SOPA. The land sits next to Keys’ home on Boundary Street. Robert Horton, director of Scioto County Economic Development, says the land was sold for $2,500, although some officials maintain it was valued at much more, perhaps as much as $7,000. However, Horton says the property was sitting vacant and unused, and now will be put to a legitimate purpose and, as Keys points out, will help improve the Boundary Street neighborhood. He adds the change in ownership puts the property back on the tax rolls of both Portsmouth and the county. Even as they talked about the property deal Wednesday at the Scioto County Courthouse, county and SOPA officials took the opportunity to brag they are ready to take advantage of the coming arrival of the Southern Ohio Veterans Memorial Highway. Stretching 16 miles and connecting U.S. 52 in Wheelersburg to U.S. 23 north of Lucasville, the $634 million project was slated for completion in November. But a state spokesperson recently confirmed the project is ahead of schedule, though she declined to say by how much, adding an announcement is expected by early summer. Regarding the arrival of the new highway, also known as the Portsmouth Bypass, Horton and LaJoye talked a lot about how the highway is located in relation to the county airport in Minford. Horton noted the highway is part of a much larger plan dating back to the late 1950s. “The county airport is right in the middle of that,” Horton said. The airfield currently has a 5,000-foot-long runway, which Horton argued could conceivably allow the landing of a large-scale commercial flight. The airport currently caters to small charter planes, though both Horton and LaJoye seem to believe it could handle more flights with some improvements. Horton further talked about a new sewer plant built in the Minford area as well as extension of an important road in the same area. The work is being done to help attract new industry to this portion of Southern Ohio. One additional development Horton mentioned was the sale of four acres of property for $1 to a private firm, which planned on constructing a multi-million-dollar building on the site. “That contract has expired,” Horton continues. While that deal did not go as planned, Horton says the county and SOPA are not finished wheeling and dealing to take advantage of the coming freeway. “We’re going to continue to fish and bait, and something is going to happen, and you can’t say what, but it’s going to be exciting,” Horton says. Horton and LaJoye are convinced the bypass will help, rather than hurt, Portsmouth. Officials point to an ODOT study they say showed 90 percent of highway traffic cutting through the city doesn’t even stop here. “The only thing you’re going to lose is a few truck drivers,” Horton says. https://www.portsmouth-dailytimes.com/wp-content/uploads/sites/28/2018/03/web1_tom-1.jpgCity and county officials celebrated this week the cooperation they say led to the sale of a piece of port authority property to a city homeowner. 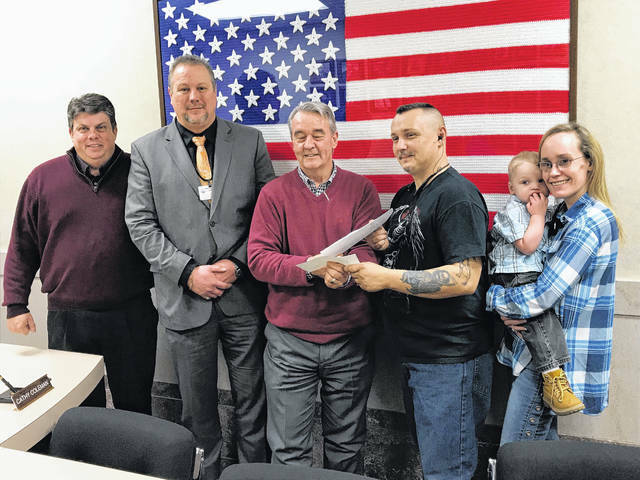 From left, Scioto County Commissioner Bryan Davis, Portsmouth Mayor Kevin E. Johnson, county development director Robert Horton, homeowner Michael Keys, his fiancee Toshia Grizzell, and her son Jaxson.